You know those dull grey days that stretch into weeks when nothing much seems to make you feel alive and happy?! No?! Count yourself lucky. Well, I have had my fair share of these days lately – a monotonous series of hours when everything feels too complicated and the impetus to get up and get going is simply not there. Quite a drab time dedicated mainly to reading so as to distract myself with other people’s stories instead of writing up my own. Deeply seeped in my melancholy, I almost replied with an outright ‘No!’ when a friend sent me a short message. It was an invitation to join her on a trip to Nove for some ceramics shopping. Now Nove is less than 30 minutes away from Vicenza. 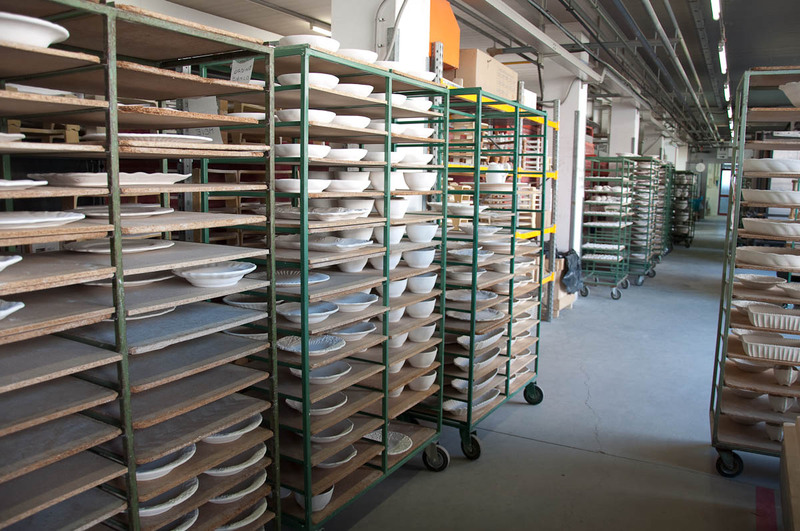 It is a small, rather nondescript town where a centuries-old ceramics industry is still thriving nowadays. We have driven many times through Nove on the way to the nearby and much more visually appealing Marostica and Bassano del Grappa. A couple of times we even made an effort to stop at Nove and explore, visiting its Ceramics Museum and the shop of a local ceramic artist. The museum’s collection was a splendid affair organised over several floors and in countless glass displays. 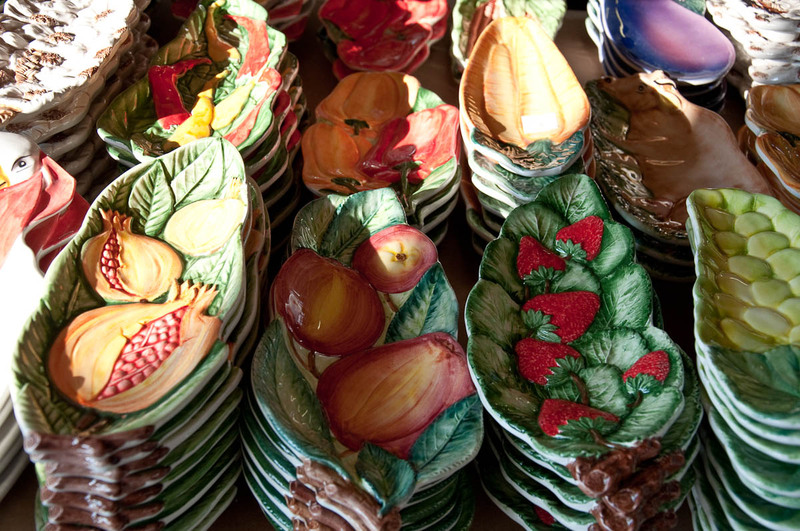 They held a huge number of simply beautiful plates, bowls, platters and anything else you can imagine made up of clay – all exquisitely painted by hand. The local ceramic artist’s shop – located right on the main street in the heart of the town – was lovely and super inspiring with its abstract shapes and vivid colours. I remember that we bought a present for a friend’s birthday from there and then we quickly jumped back in the car and drove off in search of a more exciting Italian town where to spend a leisurely Saturday afternoon. ‘Cause, yes, it pains me to say it, but on the surface Nove is not that exciting. It is a bit drab, in fact. Built on the clay-rich shores of the river Brenta, the town is tiny with its 5000 inhabitants and it doesn’t have a castle, a ruined Roman villa or anything like that. So, excluding the museum and the couple of quite splendid ceramic friezes adorning the facades of two old buildings which I had glimpsed as we drove through town, it would appear that there is not much to do there at all. 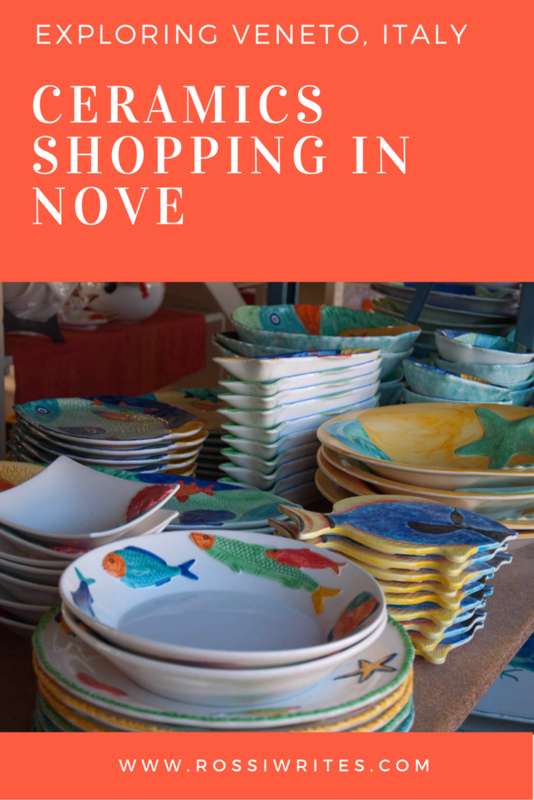 Yes, I knew that Nove is a major production centre of Italian ceramics – those colourful, happy, bright cups, mugs, plates, wall-hangings and whatnots sold in shops all through the bell paese. The type that makes you want to have a huge rustic kitchen with marble tops and spend your days cooking in wild abandon like you are some romantic heroine under the (fill in an Italian region) sun. Yet, every time that we had driven through Nove the ceramics shops attached to the local factories had been shut. Obviously, because we always managed to drive through either on a Saturday afternoon or on a Sunday. So, I would see the shops from my warm place in the car, admire quickly in passing their wares as glimpsed through their large windows, but we never stopped to have a closer look, as who goes and looks into closed shops?! Not me in any case. I am not a die-hard shopper or anything like that. And I have enough plates and mugs anyway, thank you very much! So, yes, I was about to say no to my friend’s kind invite, shopping really didn’t appeal to me considering I was feeling so melancholic inside, when something told me that I had to make an effort this time, get out of the house, meet up with my friend and actually go to Nove, and finally see its famed ceramics shops. Because they are famed. 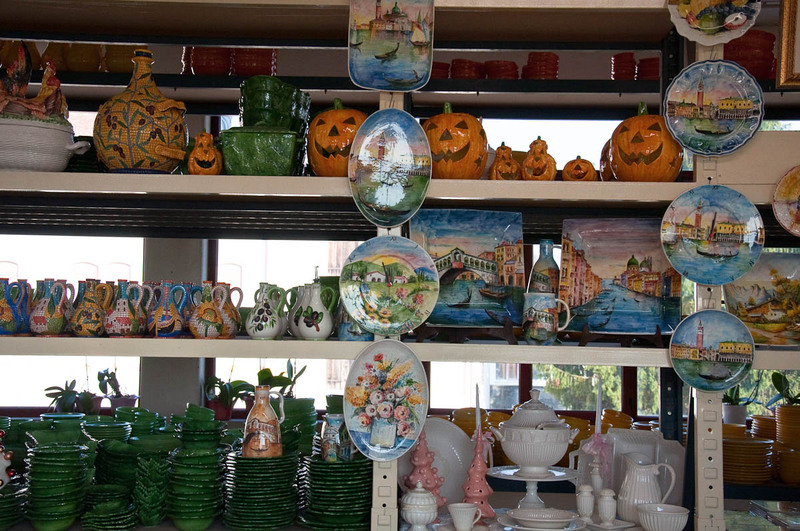 I have lost count of the times people around me have enthused about shopping there and getting the most amazing designs for a fraction of the price you would otherwise pay in bigger towns and cities of Italy and/or branded stores abroad which order their tableware collections at the Nove’s ceramics factories. This is how on a dull and grey (yes, very fitting to my mood) Friday morning, we found ourselves driving down Nove’s main street looking for one particular shop which had been recommended by a friend of my friend. 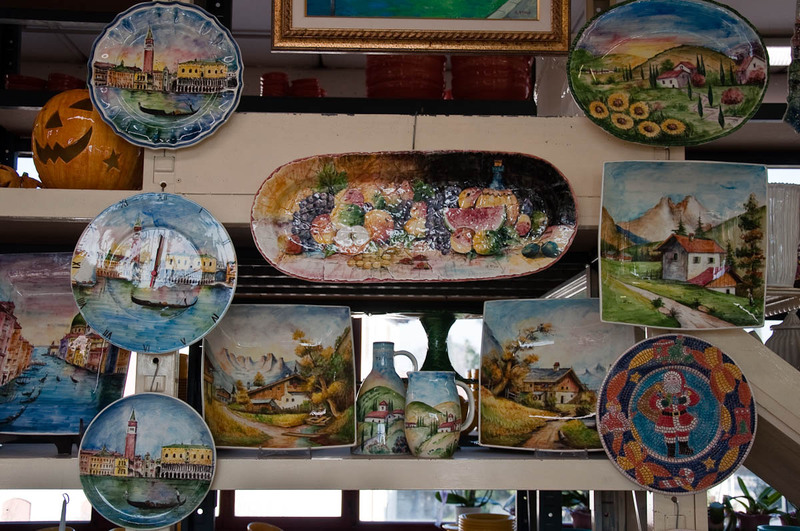 In fact there are dozens and dozens of ceramics shops all over town and it looks like you won’t make a mistake visiting anyone of them. Yet, this one was recommended to us, so the GPS smoothly took us there and we parked in the large courtyard of La Ceramica VBS. We walked into a two-storey building with large windows. 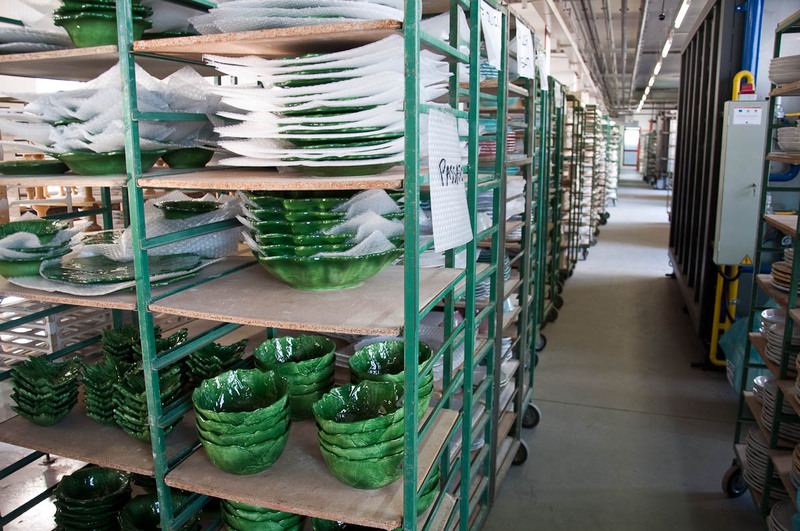 The ground floor was taken by long rows of racks housing countless plates, bowls, pitchers and mugs waiting to be fired in the kilns. By the entrance a packing station had been set up and workers were quickly yet carefully packaging a never-ending stream of orders from all over the world. We took the stairs up to the factory shop on the first floor where a miraculous sight opened in front of our eyes. A huge long room with a high ceiling brimmed over with so many different expressions of the ceramic art that for a second it was too much to take it all in. It was a very colourful, very inspiring place. 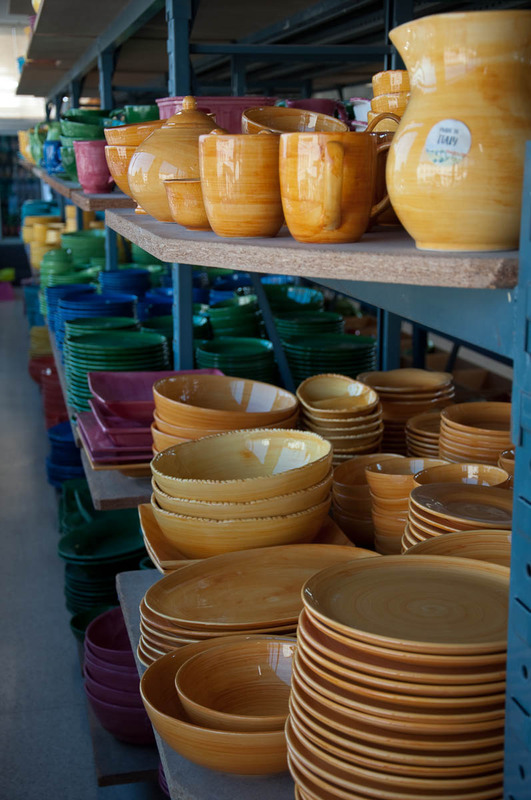 As we walked deeper in between all the tall racks heavy under the weight of pitchers and plates, and tureens, I stretched my arm and gently caressed the different items which were making me fall in love with them. A plate covered with bright yellow lemons. A small bowl in the shape of a red pomegranate. A gorgeous pitcher looking just like a bunch of white asparagus. A long oval serving dish with protruding mussels, oysters and crabs. 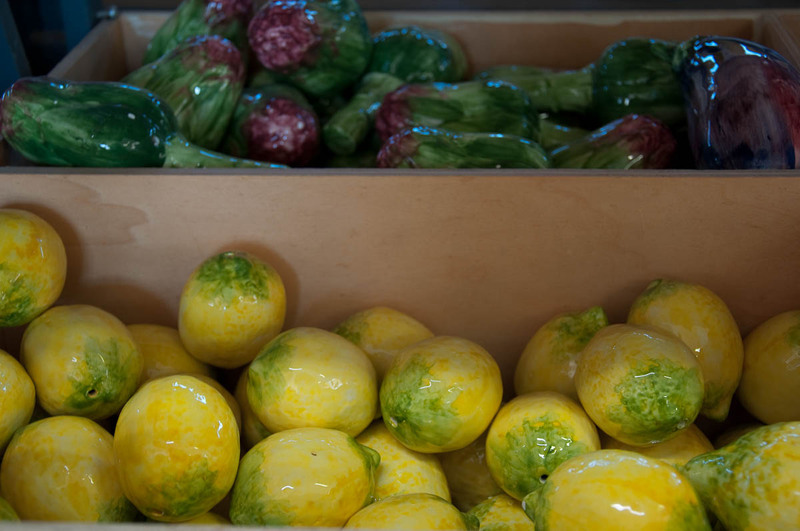 Salt and pepper shakers shaped like fruit, vegetables and even seafood. 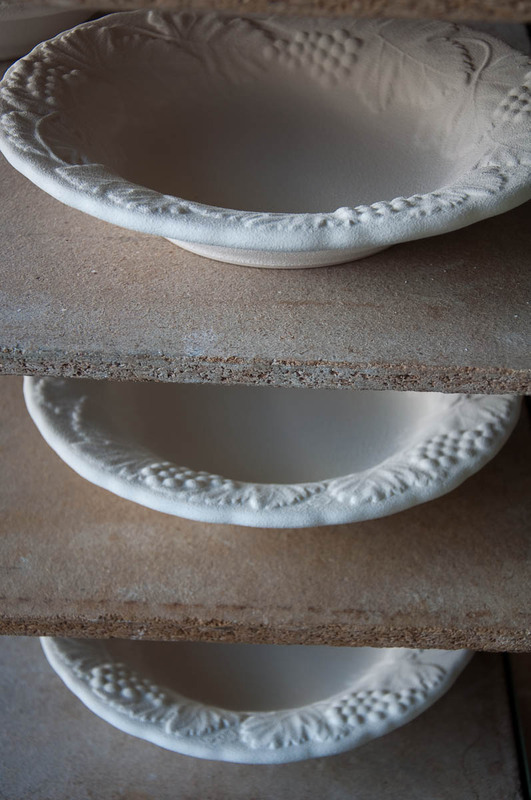 I had the impetus to run back home, get rid of all of our plates and other such things, drop them without any regrets in the biggest rubbish bin I could find and then shop, shop, shop for these beautiful, gorgeous ceramic sets. 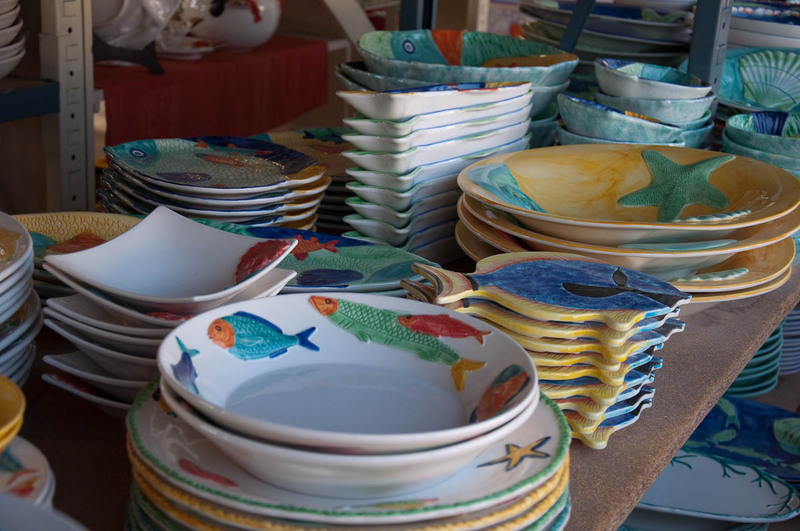 All inspired by the centuries-old ceramic tradition of Nove, all carefully hand-painted by local artists whose families have been painting ceramics since the 14th century, all covered with a luminous glass-like glaze. I walked all over the huge room, just taking it all in. Feeling more alive and more inspired than I had been for weeks. It was a wonderful sensation being so close to a living and breathing tradition still producing nowadays a form of everyday beauty which people had taken centuries to shape. It didn’t matter that the day was so grey, it didn’t matter that on the outside Nove didn’t offer much to look at, it didn’t matter that for weeks I had been feeling so drab. It was what was inside that room, inside all those ceramic factories all over Nove that mattered. 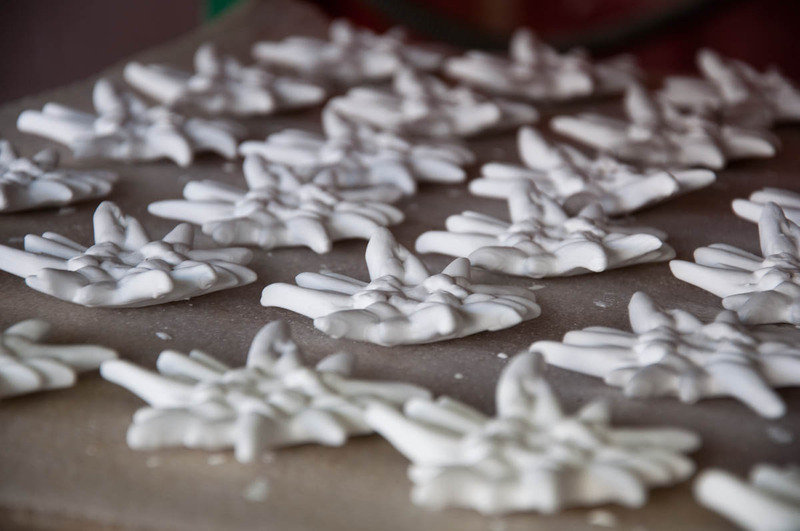 The bright colours, the ebullience of the different shapes, the items touched by caring hands, by the brushes of the local artists and the fire of the kilns. For the first time in a while I felt focused on the moment, on what was right there and right then. I felt like I could rekindle this creative fire inside myself, too. I carefully picked the items I was going to buy. Among them were two colourful elongated plates – one shaped like a branch of ripe pomegranates and another like a bunch of juicy plums. The sales assistant kindly arranged for two small holes to be drilled at the back of each of them, so that I can hang them on the wall above my computer desk at home. 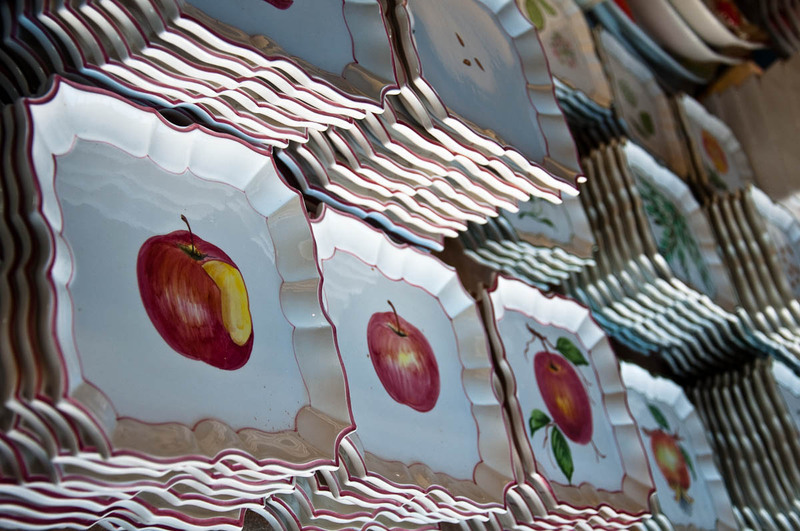 I wanted to be able to look at these plates in the midst of my typing a blog post away and feel the creative fire that had gone into them burn into me again. On the way out, my friend and I looked at the clock to see if we had time for a quick coffee before driving back home. It was nearing noon. Quite unbelievable, I thought! 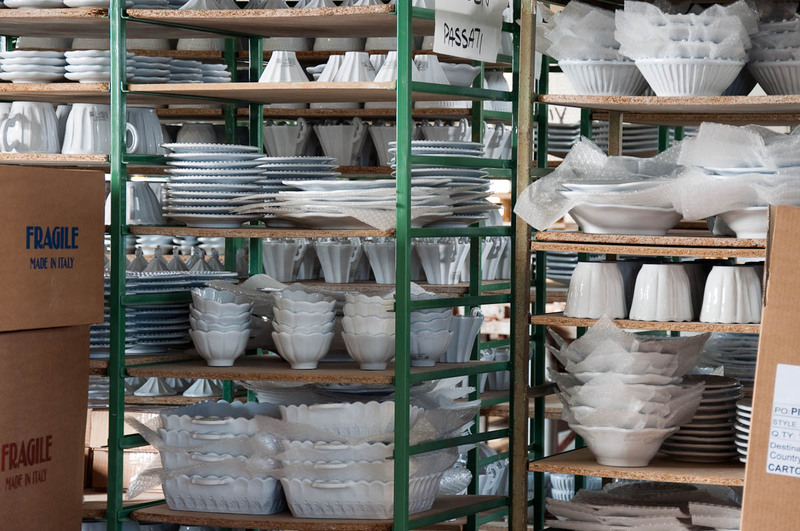 We had spent almost three hours in that factory shop, looking at things which are considerate so mundane – plates, bowls, the like. Yet, the time flew away and I didn’t feel bored not even for a second. They say that shopping is the best therapy. But don’t just shop for stuff. Look for items that someone has made with their hands and soul, items which bring a rich tradition and a creative flair into a happy harmony, items which you would be using for a very long time and which would give you joy every time you look at them. If you find yourself near Nove one day, make sure that you stop and have a look around. Now that I have seen beyond its exterior, I am actually looking forward to exploring more of its amazing ceramics shops and learn so much more about the history of ceramic-making and painting at these lands. P.S. With many thanks to my friend! Have you been to Nove before? 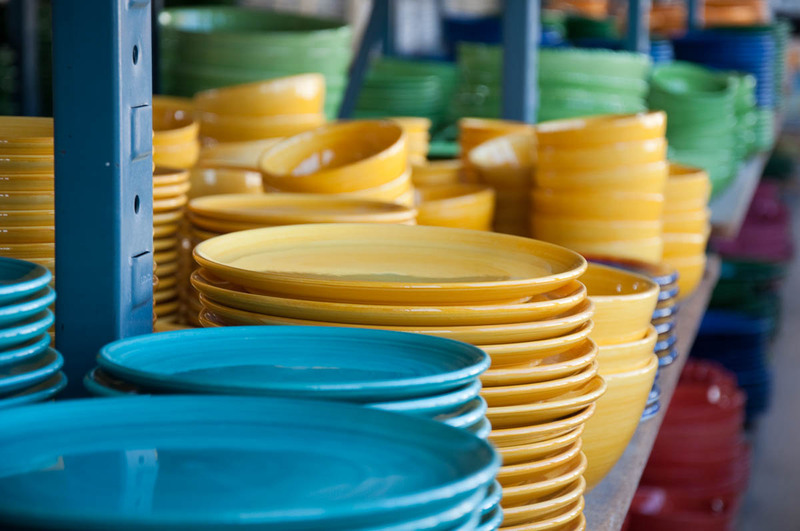 Which other ceramics shops would you recommend visiting? If you liked what you read, please, leave me a comment below. For more stories like this, please, follow me on Facebook and subscribe to my weekly strictly no-spam newsletter. Thank you!